A Massachusetts Institute of Technology (MIT) team has won a $40,000 competition set up by the Defense Advanced Research Projects Agency (DARPA) to explore how broad-scope problems can be tackled using social networking tools. The contest was timed to mark the 40th anniversary of the first day that the first message was sent over the ARPANET, the precursor to the Internet. It required competitors to be the first to submit the precise locations of 10 moored, 8-foot, red, weather balloons at 10 fixed locations in the continental United States during daylight hours. The balloons were, DARPA said, in readily accessible places and visible from nearby roads--eventually showing up in San Francisco; Scottsdale, AZ; Memphis, TN; and seven other spots. DARPA is the central research and development organization for the Department of Defense (DoD). The MIT team received the prize for being the first among 4,000 teams to identify the global positioning coordinates of all 10 balloons--done within nine hours after balloon launch. The challenge is allowing DARPA to examine research issues such as mobilization, collaboration, and trust in diverse social networking constructs. DARPA said it plans to meet with teams to review the approaches and strategies used to build networks, collect information, and participate in the game. The winning team came from MIT Media Lab's Human Dynamics Laboratory, which had received an e-mail with the $40,000 proposition Tuesday, Dec. 1, 2009. By Wednesday, three days before the balloons were to be placed, members of the lab began discussing approaches to the problem. By Thursday, they'd built a demonstration version of the Web site they would use to aggregate data. Thursday evening the site went live. By Saturday, 5,000 people had formally joined the MIT team's network. The balloons went up Saturday morning, and by the end of the day the MIT team had been announced the winners. Professor Sandy Pentland, Manuel Cebrian, Anmol Madan, Galen Pickard, Riley Crane, and Wei Pan accept their prize money from DARPA. The MIT team's approach involved an incentive structure that split up the prize money among people who helped find a balloon. Each of the 10 balloons in the structure was worth $4,000. Whoever provided the balloon's correct coordinates got $2,000; but whoever invited that person to join the network got $1,000; whoever invited that person got $500; and so on. No matter how long the chain of helpers got, the total payment would never quite reach $4,000; whatever was left over would go to charity. In principle, some people in the payment chain would end up getting only a few cents. The 18th person in a chain, for example, would receive only two cents. But Galen Pickard, a graduate student in the Human Dynamics Lab who was part of the MIT team, said the chain's "long tail" gave people an incentive to spread the word about the MIT team's offer. "If I tell somebody, and they tell at least two people, mathematically, I do better than if I hadn't told them," Pickard said. "It's designed explicitly so that I actually am incentivized to tell you and then have you tell all your friends." If the payment scheme limited its rewards to only a couple of participants, Pickard explained, a participant in the contest would have an incentive to tell as many other people as possible about it--but then try to prevent them from telling anyone else. Ultimately, the incentive design meant that the MIT team wouldn't get any of the prize money. But according to Alex "Sandy" Pentland, who heads the Human Dynamics Lab, the team's real motivation in entering the contest was "to try out some of the ideas we have been playing with"--including how information flows through an ad hoc network with many different distribution mechanisms. The team used popular Web sites such as slashdot.org to publicize the effort. To participate in the incentive program, however, required registering on the MIT team's Web site, which Pentland called a "concentrating mechanism." That's an important distinction, he said. "This is one of the first examples of combining these different types of media. You can imagine doing that more in the future, where all sorts of government things, all sorts of societal functions, have many different types of channels--broadcast, social networking, point to point, peer to peer--and that those are fluidly interleaved to be able to find the right resources, validate them, concentrate them, and then do it again. And we don't know anything about that, at the moment, I don't think. I don't think anybody's ever done stuff like this by thinking of it as a computational problem." One aspect of the research that will definitely continue is how to filter out reliable data from unreliable data. According to Pickard, about half of the balloon sightings reported through the MIT Web site contained inaccurate data; some were intentionally faked. "There were other teams who were actively trying to deceive us," Pickard said. "We talked to them afterwards, and they said they had fun spamming us with false information." The researchers will look for patterns in the statistics to expose potential true and false reports. For example, Pickard said, if several balloon reports came in that specified the same general geographical area but varied slightly on GPS coordinates, they were likely to have come from people who'd seen a balloon firsthand but couldn't track down its precise location. Those that came in with exactly the same GPS coordinates could have had a common source, such as a planted posting on the Internet to mislead the team. "The Challenge has captured the imagination of people around the world, is rich with scientific intrigue, and, we hope, is part of a growing 'renaissance of wonder' throughout the nation," said DARPA director, Regina Dugan. 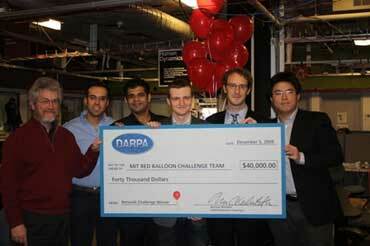 "DARPA salutes the MIT team for successfully completing this complex task."